Mailing Bag | How can I recycle this? 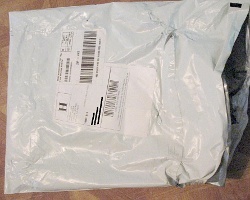 How can I reuse or recycle plastic shipping/mailing bags? First off, I absolutely love your website and all the nifty and creative ideas your community finds. Now for a confession: I am a bookworm. I typically go through 100+ novels a year without breaking a sweat. In an effort to try and green up my hobbies I’ve stopped going to the used bookstore as often, as it is a twenty mile drive, and when I do go I always buy in bulk. I’ve also switched from Amazon to thriftbooks.com. They’re consistently cheaper, and they reward you for buying used books out of the same location. My problem? Amazon always uses boxes, even if it was three or four of them per order. My new website sends my books in one large plastic bag (picture enclosed) that is numberless as far as recycling is concerned. The bags in question (I’ve amassed six so far) are 12×16 inches and have some minor holes from the shipping process. The texture of the bag isn’t conducive to making it into plarn, as it stretches out very easily. Any other ideas? The first thing you should do is email thriftbooks and explain your problem – they might not take action and change to cardboard (or similar) straightaway but the more people who complain about it, the more likely they are to change at some point — so join that chorus. 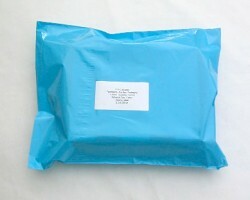 If they’re in good condition, and have been opened neatly with scissors, they can be reused for their original purpose – as a slightly smaller mailing sack next time you need to send something out. Unless you send a lot of things though, they may quickly mount up. When we get those type of bags (and actually there is one on my desk right now that needs reusing! ), we tend to use them as bin liners – obviously holey ones aren’t going to be good for small/wet rubbish but they’re fine in most circumstances. That’s not terrible creative though – any other ideas?